These super easy Slow Cooker French Dip Sandwiches are packed with flavor and make great party food or a tasty weeknight meal! Whether you’re hosting an epic football party or need a simple weeknight meal during a crazy week, these easy Slow Cooker French Dip Sandwiches are juicy, flavorful and always please any crowd. My slow cooker gets a workout this time of year. There is nothing better than spending a few minutes prepping a meal in the morning and having it nearly ready to roll after a long, busy day. 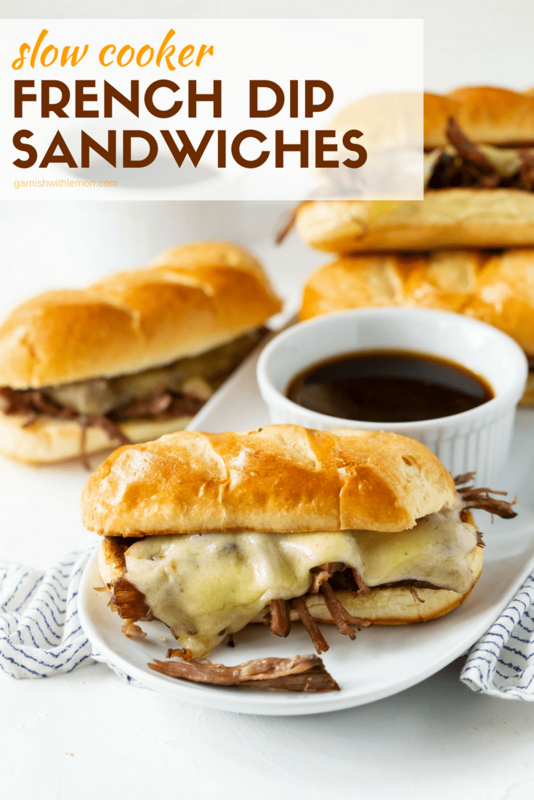 These Slow Cooker French Dip Sandwiches are one of my go-to recipes for an easy party menu or an over-scheduled evening. What are French Dip Sandwiches made of? A more traditional French Dip sandwich might be made with thin slices of roast beef (either leftover from a beef roast or purchased from the deli if time is tight). It is nestled on crusty rolls, covered with gooey melted cheese and dipped in au jus dipping sauce. These Slow Cooker French Dip Sandwiches rely on shredded beef that has been seasoned with rosemary, thyme and garlic powder and slowly simmered for 8 hours to create the most tender, flavorful bites of beef ever! Of course, a French Dip isn’t a French Dip without au jus dipping sauce, and that’s where the slow cooker method rocks. The meat that has been simmering away in the slow cooker for hours also gets a double dose of flavor when you dip the sandwich in the slow cooker juices that have been given off as the beef cooks. The au jus will look rather cloudy straight out of the slow cooker. If you prefer a clearer au jus for dipping, pour the pan juices through a fine mesh strainer. What cheese do you put on French Dip Sandwiches? 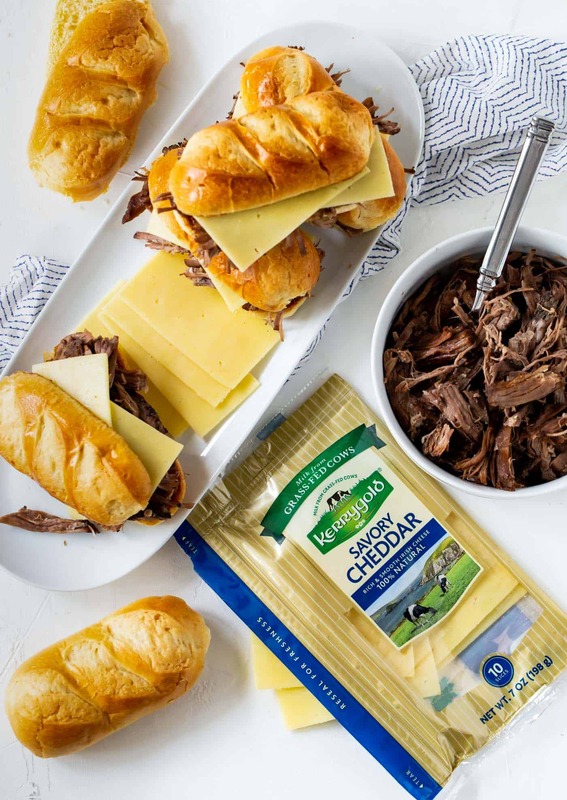 The sky is the limit for cheese options, but for my money, I top my French Dips with Kerrygold® Savory Cheddar Cheese Slices. The snappy, rich flavor is an ideal match for the well-seasoned beef. Make the beef a few days ahead of time. Shred and cool completely. Store the beef in some of the au jus sauce from the slow cooker so it doesn’t dry out when reheated. Reheat the meat gently. More heat is not better here. I’ve even reheated in a slow cooker for a party, and it worked great. Kept the meat warm until serving, too. You’ll notice a layer of fat that accumulates on top of your au jus sauce after you refrigerate it. That’s normal. It’s just the fats that rendered out of the beef while cooking. You can easily remove it before reheating. Hosting a large group? Butter and toast the rolls before guests arrive. Keep them loosely covered until it’s time to assemble the sandwiches. Obviously you need a slow cooker, and this one is a keeper because you can set it and forget it. It will even keep your food warm if it’s done cooking and you’re not home! This set of fine mesh strainers is a workhorse in my kitchen. You’ll need one to strain the au jus sauce, but the variety of sizes is great for all sorts of meal prep in the kitchen. These meat claws are the sort of thing you don’t think you need and then once you get them, you’ll never go back to struggling with two forks again. Dishwashable, too! 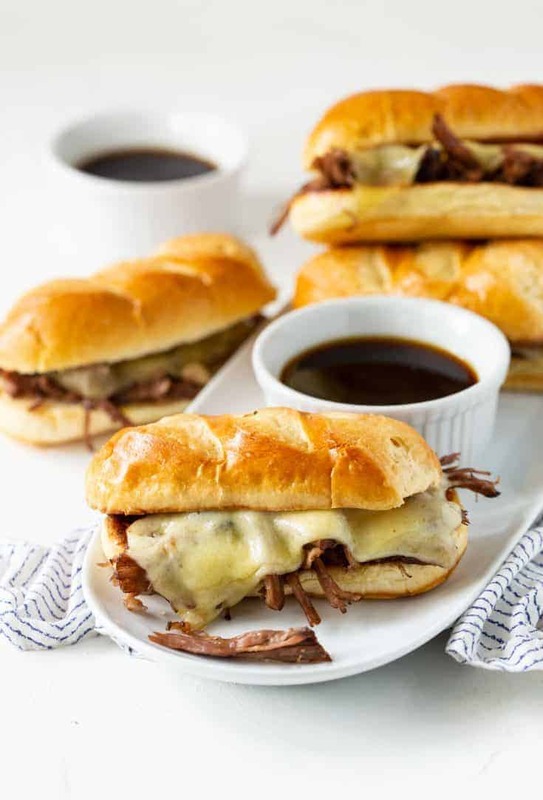 Add these easy, flavorful Slow Cooker French Dip Sandwiches to your menu for your next party (or even dinner next week)! We’re crushing on all of these slow cooker sandwiches. Great for dinners and easy entertaining! Place chuck roast in slow cooker. Add water, beef bouillon, soy sauce, rosemary, thyme, garlic powder, bay leaf and peppercorns; gently stir. Cover and cook on low for 8 hours. Carefully remove beef from slow cooker. Shred beef and set aside. Strain the au jus and set aside. Preheat the broiler. Split the rolls in half and place cut side up on sheet pan. Brush rolls with melted butter and broil until toasted. Pile beef onto toasted rolls and layer cheese on top of meat. Broil until cheese is melted. Serve with warm au jus sauce.